To-do lists can be an excellent tool when it comes to time management. If you are trying to squeeze more productivity out of your day a to-do list will help keep you on top of your tasks. 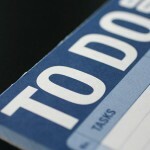 1) Planning and organization – regularly making and updating a to-do list helps keep you focused on what needs doing. This helps you keep your goals in mind and will consistently bring you closer to achieving them. 2) Motivation – one of the most enjoyable things about having a to-do list is crossing things off. This simple act helps you to see your progress and keep you motivated toward finishing the remaining tasks. 3) Use your down time – having a list of tasks on hand allows you to find better ways of using small pieces of time you may find during the day. Waiting in line? In between appointments? On the bus? Check your list – you may find a task that allows you to take advantage of this piece of time. 4) Prioritize and optimize – seeing your activities written down in front of you helps you to see what is important and what needs your attention. It will also allow you to group together similar tasks to help save you time and effort. 5) Reduce stress – knowing that you won’t forget important tasks can alleviate a lot of stress. Also, the process of recording your thoughts into a to-do list helps clear your mind of trying to remember everything that you have to do. Once created, you only have to remember to take your list with you. 6) Ongoing planning – it isn’t always possible to finish everything on your list. In this case you can get a head start on tomorrows list by transferring things you didn’t get to today. This will help ensure you don’t forget to do important things. This can also be used as a form of ‘constructive procrastination’ – putting off the less important things until you have the time, or until you decide you don’t need to complete that task after all. 7) Stay focused – getting into the habit of creating a list on a daily basis helps you to organize and plan your day and stay focused on results. This can help you avoid time wasting activities that don’t help you to move forward. 1) Avoiding work – don’t spend your time making lists and planning instead of actually doing what you need to. If you find yourself in this situation you should limit the size of your list and/or the amount of time you spend making it. 2) Ignoring high level planning – if you make to-do lists but don’t have a larger plan for what you want to achieve then a to-do list will be less effective than it could be. Make sure you spend time creating medium and long term goals and incorporating tasks from these goals into your daily to-do list. Climbing up the ladder faster isn’t useful if it’s leaning against the wrong wall. 3) Take a break – we all need some down time to relax and enjoy time in an unstructured and spontaneous way. If you have a day off or are on vacation feel free to ease up on the to-do list and just relax and enjoy yourself. How do you use a to-do list? What other time saving strategies do you use? Please share your thoughts in the comments below.